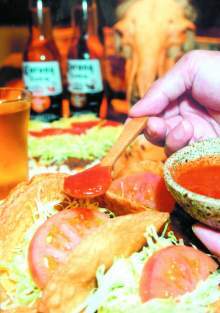 In business for more than 20 years, Senor Taco (the tacos shop in Plaza House in Okinawa City) has launched a little brother shop named Tienda in Chatan Town. It welcomes its customers in Kitamae, Chatan Town, and started business on Aug. 25. The owner, Masanori Hanashiro along with his older brother, has worked at Senor Taco since its opening. Over the years he has earned a distinguished fame among tourists and American taco lovers, and finally decided to open his own shop. He also decided to give his secret taco recipes to his old friend and junior of his school days, Yasumitsu Toyoda, the manager to be of the new shop. The taste and cooking style of Senor Taco has been successfully transferred to this new shop. But Toyoda is also trying hard to create some new variations based on the original. “I like to say that the taste is in transition to a new stage,” Toyoda says. He adds modestly that “It is important for him to make thousands of trials and errors to discover a better tasting taco. Then the people will come around every day.” He also states confidentially “A good rumor of good food will prevail among people without showy commercials.” He knows that Okinawan gourmets will not take the time to look further or at a fancy location of a restaurant or shop for good food or atmosphere. He knows that, so he dares to simply keep continuing his trials and errors every day and night in order to make the ultimate taco that the customers will love. Not that he has not paid attention to the interior. 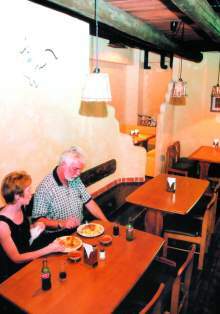 The inside walls are plastered like a Mexican style house. Mexican and Indian handicrafts, including Indian dolls, ceramic pots, buffalo’s skull, and sand paintings are spotlighted with a dim light. An ‘Easy-come-in’ style atmosphere, almost like a casual coffee shop is Toyoda’s goal. Besides, the prices are outright cheap. A set of four of tacos cost only ¥500. For now the only flavor is beef, but tuna is coming soon. Onion rings (¥300) are also popular and cooked to bring out the good taste of fried juicy onion with salt. Soft drinks (¥100) and beers (Corona and Japanese) are available. Taco rice costs ¥500. The business hours are from noon to 1 a.m. Selling his inexpensively priced and tasty tacos Toyoda is confident that a boom will be just around the corner. The phone number of Tienda is 098-926-0005. To get there, take Hwy 58 to south towards the Foster Kitamae Gate. Tienda is in the same building with Chinese Restaurant Dragon before the gate.